Leandro Castello’s research program focuses on the ecology and conservation of fish and fisheries in relation to global change processes, with particular attention to tropical regions. 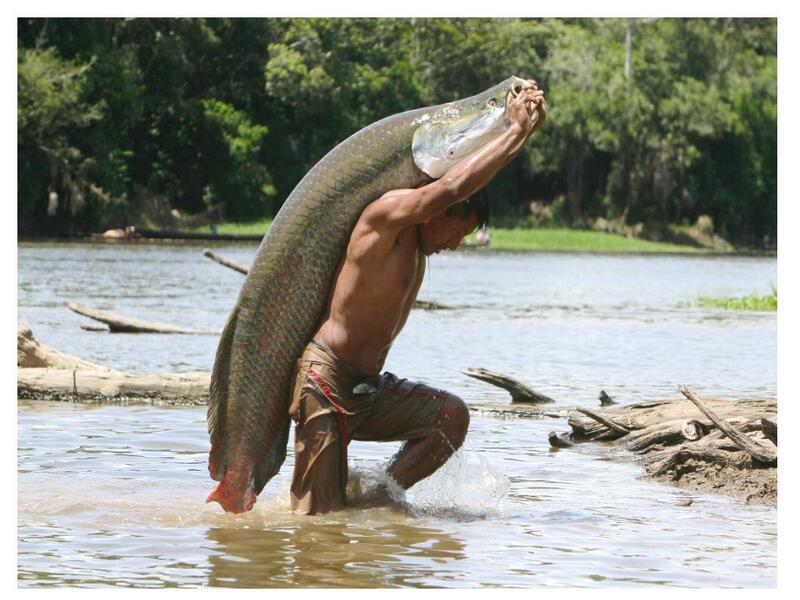 Most of his research has been on Arapaima spp., one of the largest and most overexploited fishes of the Amazon Basin. His research on arapaima has focused on the migration, reproduction, abundance, and population dynamics, as well as on the skills and knowledge of arapaima fishers. These studies have led to the development of a successful model of community-based management, where fishers themselves assess arapaima populations to determine fishing quotas*. This model has been successfully replicated throughout the Amazon, in and outside Brazil. Lorena Candice, one of the FEME members and a personal fan of Leandro’s, interviewed him about his research. She is personally happy for having had this chance and we are even happier for learning about his opinions. FEME: After almost 20 years managing arapaima in the Mamiraua Sustainable Development Reserve, what is your evaluation of the expansion and evolution of the arapaima management throughout the Amazon, within and outside reserves, and within and outside Brazil? LC: I think the result of that work has been outstanding. We had not idea that it was going to work as well as it did, and that it was going to expand to almost 500 fishing communities throughout the Amazon. FEME: What are the main challenges faced by managers? How do you think such difficulties could be minimized? LC: I think there are several challenges. Perhaps the biggest one is finding a way for stakeholders, including fishing communities, government agencies, and the various NGO personnel involved to better understand the bio-ecological basis and intricacies of the system. Several basic requirements and features of the ecology of arapaima in the area are not yet properly taken into account, and that decreases the effectiveness of the system. Another challenge is understanding the key factors that promote or impede local communities from complying with the management system’s rules. Illegal fishing for instance is widespread and the communities need help overcoming the social and economic factors that prevent fishers from complying with management rules. FEME: As cattle raising grows in the Amazon, so does deforestation. In one of your recent papers, you showed how deforestation affects fisheries, although this is hardly ever taken into account by managers, policy makers and even by the large NGOs. Why do you think such important question has not made into the agenda of these groups? Are the local human communities already feeling the impact of deforestation in their fisheries? LC: Overall, freshwater ecosystems of the Amazon have been at the sidelines of government, conservation, and scientific agencies, so those issues just don’t get the attention they deserve. Local communities have always known that floodplain deforestation decreases fish available for harvesting, but policies to prevent further deforestation are either inappropriate or not enforced. FEME: Perhaps a more popular threat, the kind that makes the news and get into the NGOs' agenda, regards the growing implementation of large hydroelectric dams in the Amazon. We've seen some very desperate pledges in the literature regarding the effects such dams have on fish, especially on migratory ones. Are we being too alarmist or not alarmist enough? Are people already feeling the consequences of such large dams? LC: It may be too early to tell. We don’t really know. Those dams certainly impact the environment and livelihoods, and one of two will not cause much harm. But the real issue is that several large dams, plus thousands of small stream dams, will certainly cause major changes for which no one is ready to manage. A great deal of research is needed before we can predict their impacts with a reasonable degree of certainty. In the lack of further information, the more cautious we are, the safer future generations will be. FEME: If we assume that we will follow the same pace we did so far regarding how we treat the Amazon, what should we expect to happen to Amazonian fisheries? LC: Their long-term demise as we now know them. We’ll probably be eating tiny detritivore fish. *most of this text was extracted from Leandro´s blog.